Napoleon was born in Corsica off the Italian coast. Napoleon’s greatest lovers were Josephine, born in the Caribbean; Marie Walewska, a Polish princess; and his second Empress, Marie-Louise–Austrian. Moscow was set on fire. Napoleon’s army was forced to desert the charred ruins at the onset of the Russian winter. Napoleon deserted the remnant of his retreating army, which was destined to die, almost to a man, in the snows of Russia. In the third month…the boar and the leopard meet on the battlefield…. In June 1815, three months after his escape from exile, Napoleon–whom Nostradamus calls the boar–fought the Duke of Wellington at Waterloo. Napoleon called Wellington the Leopard of England. At Waterloo, Wellington’s battered army had withstood every French attack. 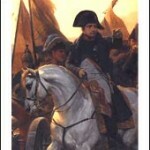 At sunset, Napoleon hurled his own Imperial Guard in one final charge. As the French attack mounted the ridge, the Duke and his men could see the brass eagles atop the standards of Napoleon’s Imperial Guard swinging against the setting sun. Moments later an English volley shattered their charge. The French were routed. Napoleon was exiled to the tiny island of Saint Helena, where he died in 1821. Prussia and Russia will divide Poland among themselves. In 1805 a war will break out between France and Austria, and if Austria will not make peace, she shall lose everything. Austrian forces were routed by Napoleon at Austerlitz in 1805. Francis I quickly sued for peace and saved his empire. A year later, in 1806, war between Prussia and France will begin. In 1807 another war, this time between France and Russia, will break out. Napoleon fought and defeated Prussia in 1806. His forces collided with the Russians in 1807. In 1848, a terrible revolution will spread over all Europe. Kings and emperors will descend from their thrones. Europe did experience widespread revolutions in 1848. The French king Louis Philippe was deposed. Horses will be kept for pleasure and ornament, nothing more, in the days to come. When the animal tamed by man begins to speak after great efforts and difficulty, the lightning so harmful to the rod will be taken from the earth and suspended in the air. Iron roads will be built, and iron monsters will bark through the wilderness. Cars without horse and shaft will come, and men will fly through the air like birds. Carriages will be moved by a strong and beautiful and simple admixture of aqueous and atmospheric gases easily condensed, so simply ignited, and so imparted by a machine resembling our [steam] engines, as to be entirely concealed and manageable between forward wheels. …magnificent music conducted on wires hundreds of miles away will play at the instigation of man. Instruments of flying may be formed in which a man, sitting at his ease and meditating on any subject, may beat the air with his artificial wings after the manner of birds. …aerial cars…will move through the sky from century to century; and their beautiful influence will produce a universal brotherhood of acquaintance. He [man] will come to take himself to the corner of Luna [the Moon] where he will be taken and placed on alien land. This entry was posted in Famous Fulfilled Prophecies and tagged Andrew Jackson Davis, Duke of Wellington, Hogue, Marie Louise, Moll Pitcher, Napoleon, Nostradamus, prediction, predictions, prophecy, Prophecy of Warsaw, Waterloo. Bookmark the permalink. Post a comment or leave a trackback: Trackback URL.